Part I of our Research and Test Reactor Series looked at the promise and unique safety challenges of research reactors, beginning with North Carolina State’s first civilian-owned reactor in 1953. In Part II of our video series, we look at how the focus on safety of these reactors evolved into a concern about their security. The Atomic Energy Commission (the NRC’s predecessor) had developed design requirements for research reactors with large safety margins that tolerated errors. Extensive training and supervision was required of licensed operators. Sabotage was foiled by making the reactors’ uranium fuel difficult to remove or destroy. However, weapons proliferation became a persistent concern. Reactor designers favored fuel highly enriched in fissionable uranium-235. Uranium-235, however, was also the stuff of atomic bombs. Initially, the AEC only permitted export of reactor technology with low enrichment, but in the 1960s, it granted international requests to U.S. manufacturers for high performance research reactors. The reactors needed only small quantities of enriched fuel, and it was believed bilateral agreements and regular inspections would assure the used fuel was returned to the U.S. But events in the 1970s – including India’s detonation of a nuclear device made possible with fissionable material from a Canadian research reactor — demonstrated the limits of this approach. Lowering the fuel enrichment was seen as a viable solution. In 1978, the Department of Energy launched a program to develop a low enriched fuel that met the performance needs of research reactors. In the U.S., operators of 20 research reactors opted to switch to low-enriched fuel. After the 9/11 attacks, the United States launched the Global Threat Reduction Initiative to accelerate the conversion to low-enriched fuel. Twenty-seven reactors around the world, including six in the United States made this conversion, taking out of circulation enough fissionable material to make 20 crude bombs. The NRC also pursued enhancements against sabotage and theft with better staff background screening, access controls, security searches, and coordination with emergency responders. The decline of the nuclear industry since the 1970s and the production of isotopes abroad have reduced the need for research reactors in the U.S. Their numbers have dwindled to about 30. This brought a new concern — the vulnerability of the nation’s isotope supply for medical uses, especially molybdenum-99. The video explores how that vulnerability is being addressed and how the NRC continues to ensure research reactors operate safely in today’s threat environment. I hope you’ll take the time to watch the video. It’s been 40 years since the Nuclear Regulatory Commission began operations on January 19, 1975. To be sure, the agency inherited a mixed legacy from its predecessor, the Atomic Energy Commission. The AEC had established an approach to reactor safety still used today, but critics claimed it worked too closely with the nuclear industry to promote nuclear power. As a new agency, the NRC had to demonstrate that it would be an unbiased, independent regulator. Over the years, domestic and international events have challenged the NRC to define what independence meant. A new video on the NRC’s YouTube channel shows us how, in the early years, the essential elements of the NRC’s character were developed and remains today. For example, as the video shows, between 1975 and 1979, the NRC dealt with a major fire at the Brown’s Ferry nuclear power plant in Alabama, a controversial request to export uranium to India, staff dissent over reactor safety, and tough questioning of its research conclusions regarding the probabilities of nuclear accidents. From these experiences, the NRC learned that being an independent safety regulator took more than legislation. It meant cultivating a diverse staff, seeking out dissent and heeding critics. Safety research needed to be conducted free of perceived bias, and it learned the limits within which a regulatory agency may act under the United States’ constitutional separation of powers. All these lessons have proven to be an asset for the NRC when it dealt with its greatest crisis — the 1979 accident at Three Mile Island; and in learning lessons from watershed nuclear events at both Chernobyl and Fukushima. We hope you’ll take a few minutes to watch the video. As noted in Part I of this story on the NC State research reactor, the Atomic Energy Commission (AEC) was very anxious to promote the world’s first civilian reactor. But its enthusiasm was tempered by the challenge of placing a reactor safely on a busy college campus and developing an approval process for non-AEC reactors. The AEC turned to its Reactor Safeguard Committee, the forerunner of today’s Advisory Committee on Reactor Safeguards. The Committee was formed in 1947 to evaluate the safety of new reactors proposed by AEC laboratories and contractors. “The committee was about as popular—and also necessary—as a traffic cop,” recalled Safeguard Committee Chairman Edward Teller. The Committee’s most significant contribution was establishing a conservative approach to safety given the engineering uncertainty of that era. “We could not follow the usual method of trial and error,” Teller said. “The trials had to be on paper because the actual errors could be catastrophic.” The Committee developed a “simple procedure” of challenging a reactor designer to write a “hazard summary report” that imagined the worst “plausible mishap”—soon known as a “maximum credible accident”—and demonstrate the reactor design could prevent or mitigate it. Five NC State physics professors designed the reactor. Here, in the reactor control room, (left to right front row) are Clifford K. Beck and Arthur C. Menius, Jr. Standing is Newton Underwood, three unidentified students, Arthur Waltner and Raymond L. Murray. To meet the Committee’s desire for inherent safety, NC State proposed a “water boiler” reactor, which was believed to have “student-proof” safety margin given its strongly “negative coefficient” of reactivity that limited greatly the possibility of a runaway. NC State also developed interlocks and an extremely dense concrete shielding to discouraged sabotage. In order for NC State to commit the funds to such a long-term project, it needed an early approval. This created a dilemma since the college did not yet have a detailed, complete design. The AEC used a two-step conditional approval that was similar to its later construction permit/operating license process. In step one, construction did not begin until NC State addressed the most important design safety issues. When it did, the AEC agreed by contract to supply enriched fuel. The fuel was not delivered, however, until NC State resolved all outstanding safety questions and a final inspection took place. With that, the first civilian reactor in history went critical in September 1953. The AEC approach to safety at NC State foreshadowed many later regulatory practices. As important as the 1954 Atomic Energy Act is to current regulatory practice, it is interesting to see that many of the critical elements have even deeper roots back toward the beginning of the atomic era. All had come to see the world’s first research reactor open for public view at North Carolina State College (NC State). Proposed by NC State in 1950, the reactor was an audacious idea when the most basic information about the fission process was a Cold-War secret. Industry and universities were unwilling to pursue civilian applications of nuclear energy that required expensive security clearances. Where others saw obstacles, Clifford Beck spied an opportunity. A physicist at NC State, Beck proposed to the Atomic Energy Commission the nation’s first nuclear engineering program built around a declassified reactor. His timing was perfect. The announcement in September 1949 that the Soviet Union had exploded an atomic bomb tipped the debate within the AEC toward those who favored declassifying atomic secrets. Former AEC Chairman David Lilienthal called on the AEC to “free the atom” for U.S. industrial use. AEC officials were elated with Beck’s proposal since it provided them with a concrete reason to declassify reactor information. They assured him they were “practically unanimous” that it would be approved. In late 1950, the AEC made public for the first time information on fission research and small research reactors, including the NC State reactor. Ending secrecy cleared only the first hurdle for NC State. The AEC had to confront difficult safety and security questions. In 1950, the 1946 Atomic Energy Act strictly limited uses of fissionable material. How could the agency provide bomb-grade fuel to a civilian reactor? How could it prevent sabotage of an unguarded reactor? How could the AEC ensure safe operation on a densely populated college campus? And who in the AEC should approve the reactor? In answering these questions, the agency foreshadowed many of the later practices it followed in licensing nuclear power reactors. We will turn to that story on Wednesday. 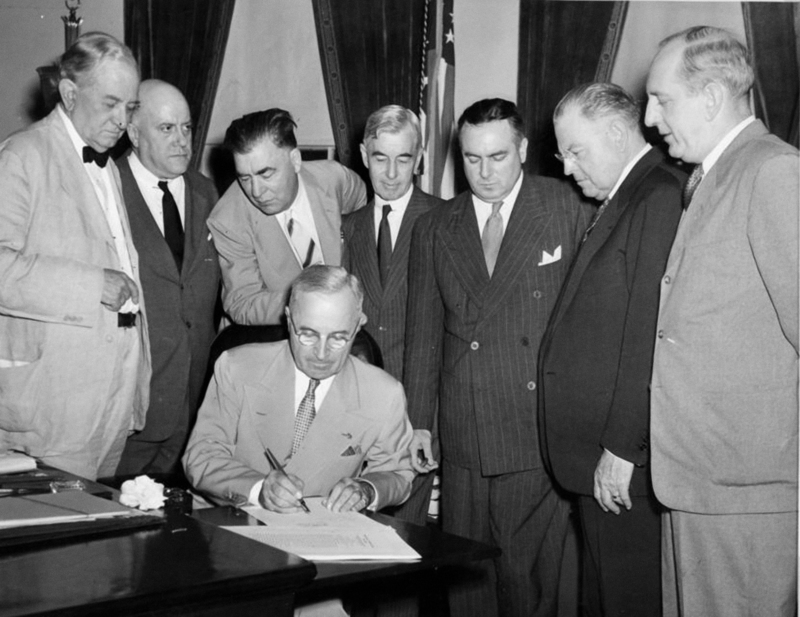 President Harry Truman signed the Atomic Energy Act 68 years ago this month – Aug. 1, to be exact. The act set up the Atomic Energy Commission, a civilian agency charged with managing the nuclear technology developed during WWII. Later, the AEC was divided into two agencies – the NRC and the Department of Energy. The NRC was tasked with regulating civilian nuclear technologies. Pictured behind President Truman (left to right) are seven men: Tom Connally, Eugene Millikin, Edwin Johnson, Thomas Hart, Brien McMahon, Warren Austin and Richard Russell. What did the men all have in common? Photo courtesy of the Department of Energy.